Urban Airship support for in-app billing on the Android mobile platform simplifies content management, device authentication and server infrastructure to make app monetization a reality for mobile apps in the Google Android Market. Today, Urban Airship, provider of a mobile services platform that helps developers create more engaging and profitable mobile apps, announces availability of In-App Purchase for Android. This highly anticipated feature set allows developers to offer additional content to users right within the app by offering simple, one-click billing. In-app purchase is core to many app-monetization strategies. In-App purchase helps apps monetize by adding additional revenue streams for mobile content; developers need not rely on revenue from the initial app download. In fact, the “freemium model,” in which apps are free for initial download and offer users opportunity to enrich their app via additional content, accounts for a fast-growing distribution of revenue amongst the highest grossing mobile apps. According to research firm Distimo, 34 percent of the revenue generated by the most successful iPhone applications in the United States was generated by free applications featuring in-app purchases; additionally, the share of revenue generated by in-app purchase more than doubled in the six months ending in December 2010. 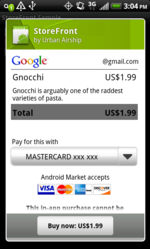 Android developers can now take advantage of this same revenue growth opportunity. Urban Airship provides a "last mile" service to ease and simplify integration of in-app purchase features for the new Android offering, announced last week. Urban Airship has been participating in Google’s beta program and developing in lockstep with Google to bring its tools to market in time for this highly anticipated feature. Urban Airship first introduced in-app purchase services for iOS developers 18 months ago, and is pleased to roll-out a set of similar services to the Android developer community. To date, Urban Airship has facilitated more than 2.8 million in-app transactions and now this number will grow even faster. Dynamic content: The Android Market limits application size to 25mb (even over WiFi). Apps with rich content and media files can use Urban Airship In-App Purchase to grow beyond that. Developers upload paid and free content to the Urban Airship servers, which delivers the content to the end user when needed. Security: Urban Airship reduces complexity around security by validating all purchase receipts before delivering content to the application. Versioning and Updates: Urban Airship tracks updates to purchasable content and notifies users when updates are available. Developers can fix bugs in their updates without shipping an additional app update. According to independent metrics firm AndroLib, the rate of Android application growth has been on a nonstop rollercoaster ride upward for months, and -- correlating with the overall growth of the platform -- it shows no signs of slowing down. This points to enormous potential to monetize mobile apps on Android. Urban Airship recently introduced Embedded Push, an alternate push notification system for Android to Google’s own C2DM. Embedded Push is more robust than C2DM and works on versions of Android from 1.6 and newer; C2DM works only on devices running Android 2.2 (also known as Froyo) and newer and requires the installation of the Android Market and a Google account on the device, adding more requirements for developers. Urban Airship has delivered more than 2.6 billion push notifications across the iOS, Android and BlackBerry mobile platforms. Urban Airship has authenticated and delivered more than 2.8 million purchases via in-app purchase.